Brittany Ferries’ Pont-Aven is saving energy and reducing fuel consumption thanks to the installation of two innovative devices on her propellers. Wärtsilä‘s EnergoProfin system is a small sub-prop, which is attached to the main propeller helmet, helping improve propulsion in water. 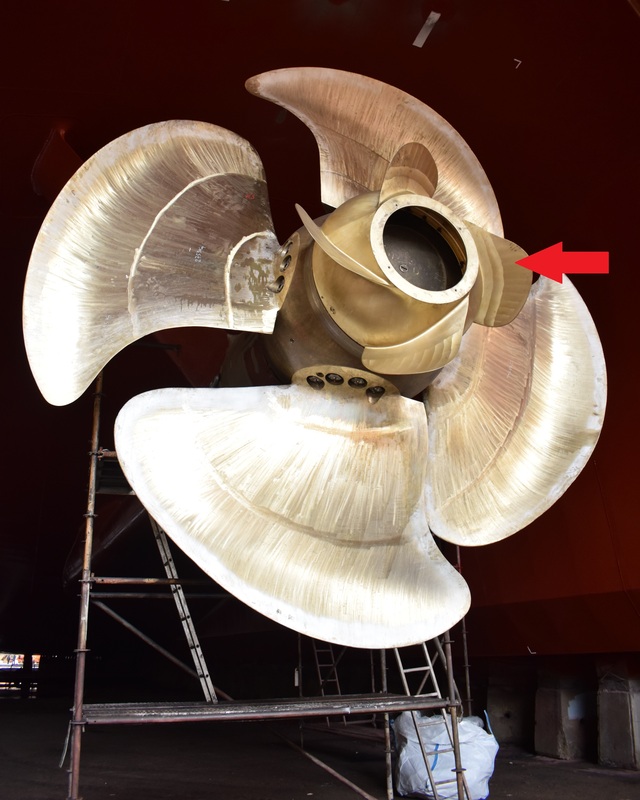 Two of these devices were installed during the ship’s dry dock in December 2018. As a consequence fuel consumption and emissions have been cut by around 2% on every crossing. This project is a small – but significant – step and it comes as part of a range of studies initiated through Brittany Ferries’ Research and Development program. 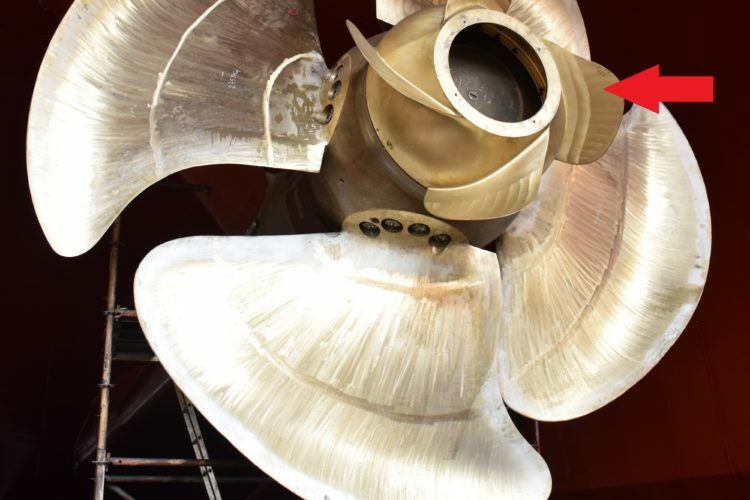 But, as Vincent Coquen, Head of R&D, Energy and Environment for the company, explains, it is not just a question of developing practical and technical solutions for today such as the propellers on Pont-Aven. “Sustainable development means looking to the future and studying innovative projects and technologies that could be used in either the short or longer term,” he said. For the past two years, Brittany Ferries has partnered with CEA Tech in France. Several projects are underway, including the development of a long-range broadband link that would use land-based transmitters to obviate the use of satellite-at-sea. A second study focuses on hybrid energy solutions for Cap Finistère, Brittany Ferries cruise-ferry that sails from the UK to Spain. The last is exploring the long-term implementation of fuel cells for powering certain of her on-board systems. Brittany Ferries is also looking at the potential for wind energy. Flettner rotors, traction wings, or modern sails are at different stages of development, but could significantly reduce ship fuel consumption and therefore emissions. In 1967 a farmer from Finistère in Brittany, Alexis Gourvennec, succeeded in bringing together a variety of organisations from the region to embark on an ambitious project: the aim was to open up the region, to improve its infrastructure and to enrich its people by turning to traditional partners such as Ireland and the UK. In 1972 BAI (Brittany-England-Ireland) was born. The first cross-Channel link was inaugurated in January 1973, when a converted Israeli tank-carrier called Kerisnel left the port of Roscoff for Plymouth carrying trucks loaded with Breton vegetables such as cauliflowers and artichokes. The story therefore begins on 2 January 1973, 24 hours after Great Britain’s entry into the Common Market (EEC). From these humble beginnings however Brittany Ferries as the company was re-named quickly opened up to passenger transport, then became a tour operator. Today, Brittany Ferries has established itself as the national leader in French maritime transport: an atypical leader, under private ownership, still owned by a Breton agricultural cooperative. Eighty five percent of the company’s passengers are British. Around 210,000 freight units are carried each year. Employment – Between 2400 and 3100 employees (including 1,700 seafarers), depending on the season. 360 in the UK. Tourism in Europe: There were 854,000 unique visitors, staying 9.2 million bed-nights in France.